Apple today began pulling apps out of its iOS and Mac app stores that display a Confederate flag. Educational apps, it seems, aren't immune from the broad ban — at least some of them. Some apps that display a Confederate flag, such as A&E's Civil War Today, remain in the App Store, while others have been removed. Initially, it was thought that only strategy/war games and simulations were being removed as part of Apple's new apparent policy to exclude apps from its app store that display the Confederate symbol — seemingly regardless of the context in which the flag is displayed. However, at least a few educational and informational apps are missing this morning as well. Civil War Photo Album is a free app that simply provides access to public domain images from the time of the American Civil War. 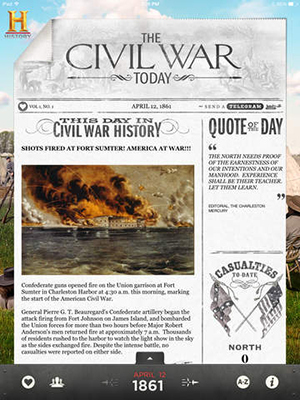 It has been removed from the store, as has the free version (Civil War Photo Album Lite). Several historic walking tour apps also seem to be missing as well, including Historic Gettysburg Walking Tour. It's difficult to say whether these or other apps like them have been removed as part of the purge or simply are no longer available for other reasons. However, of the 165 iOS apps with the phrase "Civil War" in their title (in the App Annie database), 69 had been removed as of this writing. The three apps with the term "Confederacy" in their title had been removed (including the "Confederacy of Dunces" app). And of the 41 apps with "Gettysburg" in the title, 15 had been removed. The database does not seem to have caught up to the removals, however. Several titles that are listed as current have, in fact, been removed, including the Civil War: 1863 Gold app from HexWar Games. 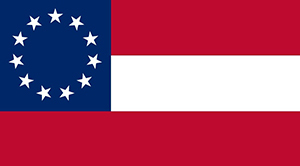 HexWar, for its part, noted that it will attempt to get its apps back into the Apple App Store by replacing the "stars and bars" Confederate flag with the less commonly used version from 1861/1862, which is a circle of stars on a blue field, accompanied by two red stripes and one white. It's worth noting that some educational apps from major players like A&E Television Networks (History Channel) have not been removed as of this writing, though those apps also include representations of the "stars and bars" version of the Confederate flag. A&E's Civil War Today remains, for example, as does Ripped Apart: A Civil War Mystery by the Smithsonian Institution. It's unclear just how many apps have been removed in the initial purge, whether any will be restored once context is established or even whether purges will continue. Apple had released no public statements about the move as of press time. According to multiple reports, developers are receiving notices explaining that their app has been removed "because it includes images of the confederate flag used in offensive and mean-spirited ways." Earlier this week, Apple CEO Tim Cook tweeted his verbal support for victims of the mass killing that took place in the Emanuel African Methodist Episcopal Church in Charleston, SC, saying, "Let us honor their lives be eradicating racism & removing the symbols and words that feed it." Apple had not replied to a request for comment on the App Store removals as of press time.